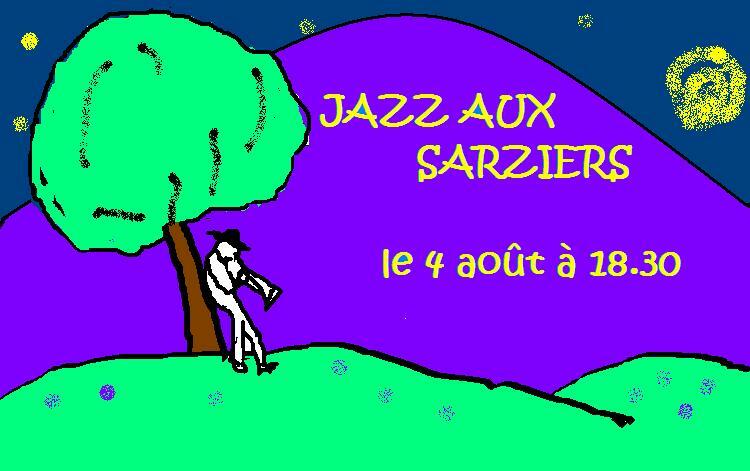 It is 25 years since we bought les Sarziers and we had decided to mark the milestone in style. Last Sunday we welcomed sixty plus guests to an amazing concert. It was a beautiful summer evening and, as they arrived our friends were able to mingle whilst they sipped an aperitif and enjoyed the glorious location and views which we love so much. Then Jazz aux Sarziers kicked off, as the sun started to go down, with the fabulous sounds of the Magnetic Orchestra, led by genius bass player Francois Gallix. The musicians loved the mood and the accoustics and played a fantastic set. After the break, the trio were joined by Markus on trumpet and his friend Hans on trombone for a second set, which ended with a surprise change of drummer, when Pierre took over, and the addition of a second trumpet played by Julien. Markus has been working up to this event for months and is totally thrilled to have had the opportunity of playing with Francois, Benoit and Nicolas who are just a great band. 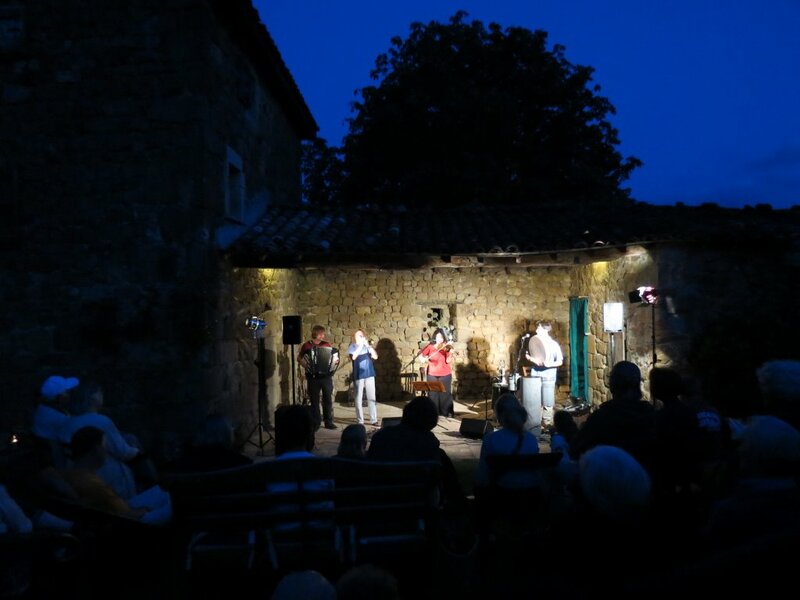 We then moved under the chestnut tree for a buffet campagnard – a relaxed dinner during which the sky changed from golden to peach and then deepening blue as the first stars appeared. 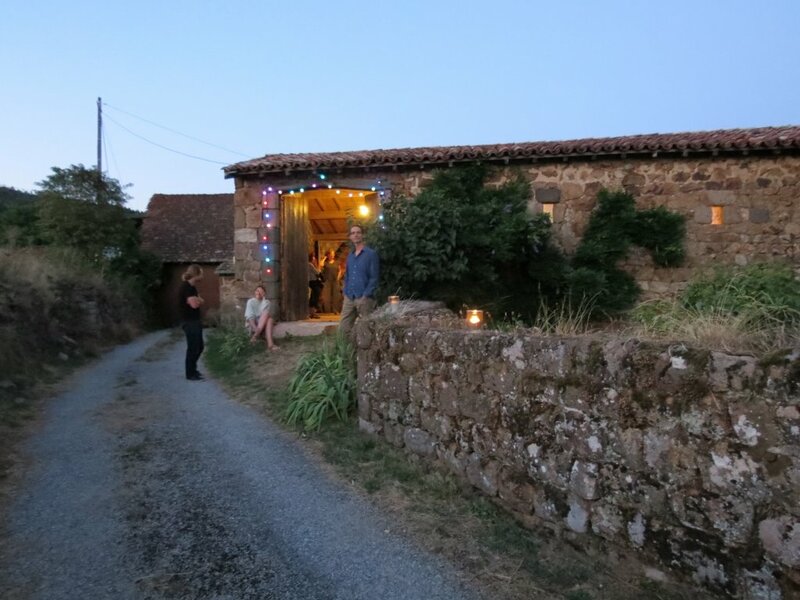 Some of our guests had not actually been to les Sarziers before and even those who had were struck by the extraordinary magic of the evening and the enchanting setting. Many friends had their children with them, who enjoyed playing in the garden, lounging in the hammock and running around in Roger’s field picking bunches of flowers for maman. Markus and I were by then floating on a little cloud of happiness. We were so touched by the generosity of the musicians and the openness and good feeling of everyone involved. And then came another surprise, which we had hoped for but which surpassed even our expectations. Our friend Vincent Magrini and the group Kalynda set up after supper and gave us the most wonderful hour and a half of Balkan music. 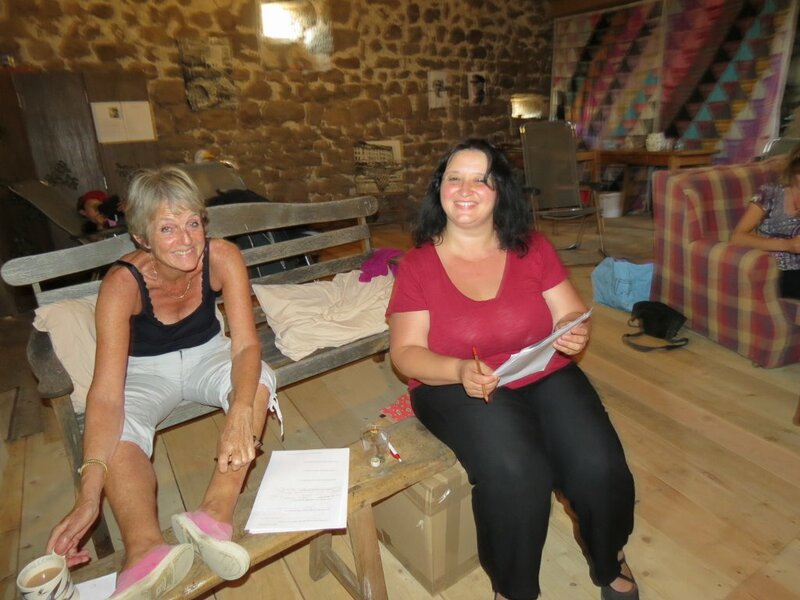 The group is led by Maria from Rumania, who works as a classical violinist in Paris but often comes in the summer to stay with Vincent and his family and make music together. She is joined by Eric on accordeon and Jerome on second violin, with Vincent on percussion and guitar. Their music is quite simply spectacular. Maria’s enthusiasm and the passion of all the players had us spellbound, and some of us dancing, led by Markus’s sister and brother in law who have travelled to Rumania and learned the traditional folk dances. 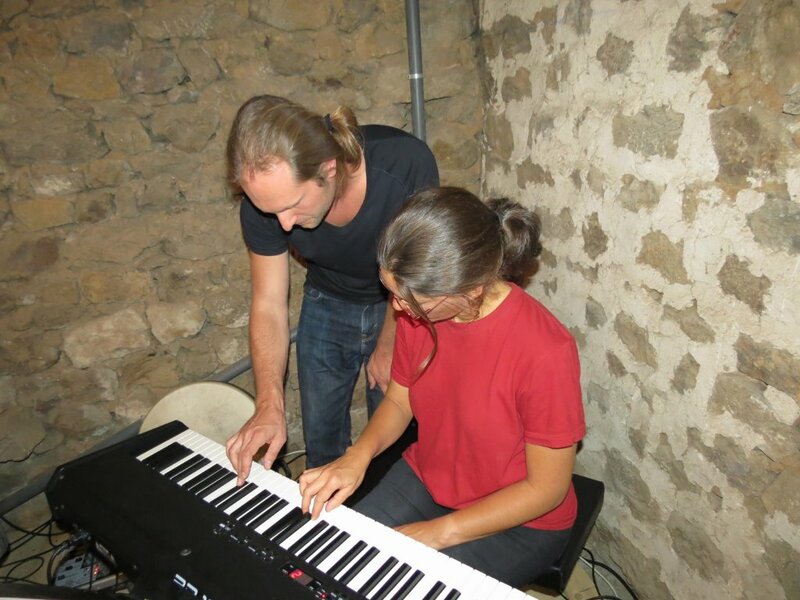 With the graceful insouciance of true musicians Julien then stepped in for a few numbers. 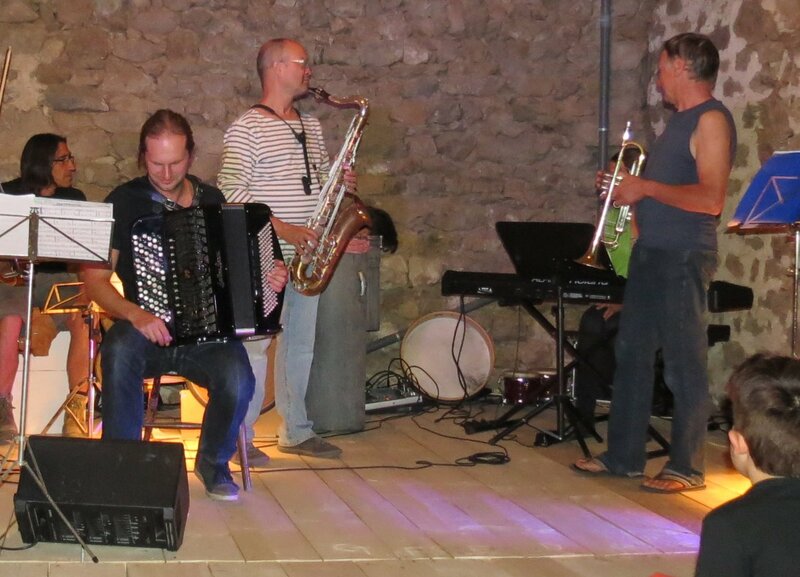 He too is a professional trumpet player in Paris and plays, amongst other groups, with the Ziveli Orkestar. The audience went wild, as they say. After the applause finally died down people began to trickle away, unwilling to break the spell, but we stayed out in the courtyard, and Vincent and Jerome played for us under the stars until 4am. Don’t forget to click on a photo to be able to see them in all their glory in a slide show. In 1988, when we fell in love with a ruin, how could we ever have imagined such an evening? 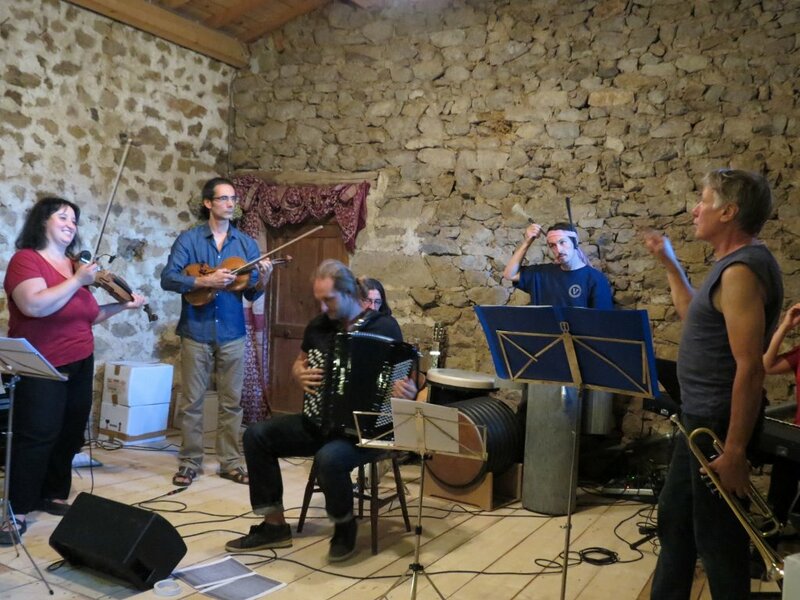 On August 4th we celebrated the realisation of our dream – that les Sarziers should have a new life – but more than that we celebrated the friends we have made here and the exceptional creative energy, originality and generosity which surrounds us and which makes our part of the Ardèche truly unique. Thanks to Brice and to Kiki for the brilliant photos!